Why Invest in an HIV Gene Therapy Cure? Research and innovation to cure HIV is developing fast. 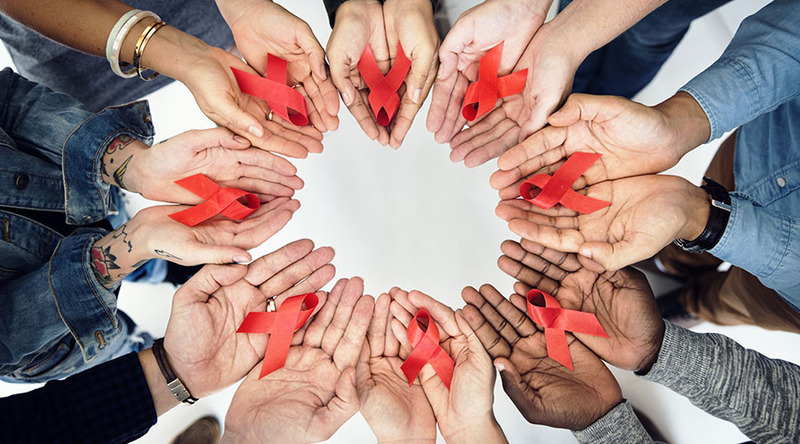 American Gene Technologies (AGT) is emerging as a leader in the field with their first functional cure for HIV, expected to enter clinical trials in 2019. Unlike the current antiretrovirals used in HIV treatment, AGT’s solution is a one-time intervention that eliminates the need for ongoing antiretrovirals, as well as their accompanying side-effects. The theory of AGT’s technology comes from a group of people who are naturally immune to the HIV virus. American Gene Technology is modifying cells in three ways to stop, turn off, and kill the virus. To understand exactly how this technology works let’s review the Human immunodeficiency virus (HIV). Viruses have a relatively simple life cycle. After entering the body, they attach to a cell to inject their RNA or DNA. Once the viral code is in the cell, it commandeers the cellular machinery to produces copies of the code and viral proteins. These building blocks form the structure and function of new virions. Formation of the viral materials makes normal functions of the cell difficult. Once the new virions form, the infected cells burst or release the virions and those virions infect new cells, completing the cycle. In essence, the virus enters cells to replicate and infect new cells. In the case of HIV, the virus attaches to the outside of a cell and injects its RNA. The RNA blueprint for the virus is turned into DNA and incorporated into the host's genome. Often the first sign of HIV is flu-like symptoms 2 weeks to 2 months after infection. The unique feature of HIV is the cells which it attacks. HIV attacks a subgroup of immune cells whose job it is to seek and destroy the HIV virus. This subgroup of immune cells are called CD4+ T cells, and they are critical to a healthy immune system response. HIV rapidly depletes this subset of the T cell population in an infected person. However, the ability of CD4+ T-cell to recover is amazing and they operate in a chronic state of recovery for up to 20 years of disease progression post-infection. But at some point, HIV begins to win depleting the entire CD4+ T-cell population. This depletion of white blood cells causes immunodeficiency or the inability to fight infection. That's why the name, Human Immunodeficiency Virus (HIV), was coined. HIV is a very clever virus; it specifically targets the subgroup of white blood cells (CD4+ T cells) responsible for protecting the body against HIV infection. The result is the cells that were originally meant to destroy the virus become its habitat. HIV interacts with this subgroup of cells through a specific handle (CCR5) present on the exterior of the cells. When the white blood cells approach to destroy HIV, HIV quickly grabs onto this handle and injects its RNA. At this point, it’s too late for the white blood cell to act. It was discovered that approximately 0.7% of the Northern European population is immune to the HIV virus. This subgroup of the population has a mutation in the handle (CCR5) which makes it impossible for the virus to attach. American Gene Technologies utilized these findings to create a genetic technique to replicate this benefit by manually turning off the production of the handle in the CD4+ T cells. The result is HIV cannot grab onto the genetically modified cell or inject its DNA making it impossible for the cells to be infected with the virus. HIV is composed of 16 different proteins. Humans have about 20,000. You can imagine that each one of the proteins in HIV are essential for it to function. American Gene Technologies new treatment turns off the production of a few key proteins with a technology called siRNA. You can think of siRNA as bounty hunters for specific RNA sequences. Remember, cells make their components and products from DNA by converting to RNA and then producing the corresponding protein. siRNA is used to block the production of a specific protein while it is still in the RNA “step”. siRNAs are a naturally occurring part of our cellular regulation making them a safe choice as a therapeutic. Some organisms even use siRNA as part of their natural immunity against viruses. Once the virus has been blocked from entering the cells the next step is for the improved immune system to play its natural role -killing the virus. With HIV unable to grab the outside of the cell, CD4+ T-cells can begin the cascade to remove the virus from the body. This result was demonstrated in the preclinical studies American Gene Technologies performed using HIV infected human blood. The result showed incredible promise for a lifelong functional cure. Virus killed by a patient's own T cells is an exciting result for the HIV community. How Soon until we have a Cure? There will certainly be a cure for HIV in the future. American Gene Technologies is leading the sprint towards this important milestone. To follow AGT’s race to a cure, please sign up for the newsletter by entering your information into the sidebar in the form in the upper right hand corner or at the bottom of this page. HIV has burdened its victims long enough. As victims and advocates, we can help by staying in the fight and supporting advancing technologies.